A view of the Atchison, Topeka and Santa Fe Railway's California Limited in Los Angeles, California shows engine No. 53 at the La Grande Station, circa 1899. "Drumhead" logos such as these often adorned the ends of observation cars on the California Limited. The California Limited was one of the named passenger trains of the Atchison, Topeka and Santa Fe Railway (AT&SF). It was assigned train Nos. 3 & 4, and its route ran from Chicago, Illinois to Los Angeles, California. Operating seven sections of the Limited was common, and during peak travel periods as many as 23 westbound and 22 eastbound sections departed in a single day. 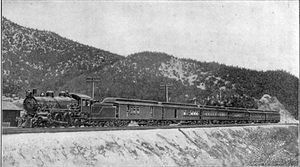 The line was conceived by company president Allen Manvel as a means to "...signify completion of the basic [Santa Fe] system..." Manvel felt he could attract business and enhance the prestige of the railroad by establishing daily, first-class service from Chicago to the West Coast. The California Limited, billed as the "Finest Train West of Chicago," made its first run on November 27, 1892, with five separate trainsets making continuous round trips on a 2½-day schedule (each way). The Limited was the first of Santa Fe's name trains to feature Fred Harvey Company meal service en route. The later trains also offered all of the amenities of the day including air conditioning, an onboard barber, beautician, steam-operated clothing press, even a shower-bath. The Limited was also the first train in the Santa Fe system to have its observation cars fitted with illuminated "drumhead" signs which bore the train's name juxtaposed over the company's logo. The California Limited was permanently removed from service on June 15, 1954, giving it the distinction of having had the longest tenure of any train making the Chicago-Los Angeles run within the Santa Fe system. The California Limited pauses after climbing to the summit of Cajon Pass in 1908. The California Limited, led by Santa Fe No. 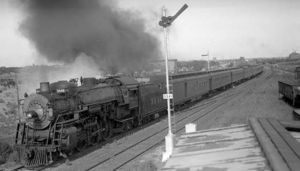 3446, is seen leaving La Junta, Colorado on July 23, 1933. 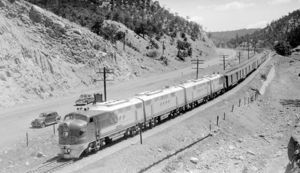 Powered by four EMD FT locomotives, the California Limited speeds through Apache Canyon near Canyoncito, New Mexico on June 27, 1947. October 1892: Pullman delivers five six-car trainsets for the initiation of California Limited service. 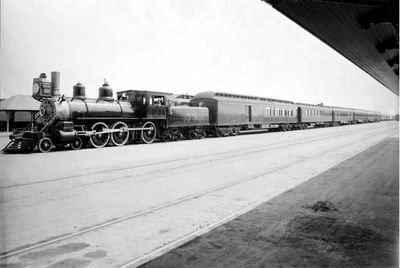 November 27, 1892: The Santa Fe inaugurates the California Limited route, leaving Chicago on a 2½-day schedule. The train would log fifteen different locomotive and crew changes. December 1, 1892: The first California Limited train returns from Los Angeles. 1893: The train receives four new elegant dining cars designed by master car builders Barney & Smith. May 4, 1896: The line is temporarily taken out of service. November 1896: Regular service on the line resumes on a 66-hour schedule. 1899: The Limited is reduced to four trains per week. 1902: The line resumes daily service on a 68-hour schedule. 1910: The trains are completely re-equipped with new locomotives and passenger cars. December 12, 1911: The Limited loses some of its prestige to the Santa Fe's new, more opulent de Luxe service. November 14, 1926: The Limited is relegated to true "second-class" status following the inception of the Santa Fe's Chief all-Pullman, extra-fare limited. Early 1930s: The train’s dining car is removed midway between Chicago and Los Angeles as a cost-saving measure. April 1, 1938: The Limited is temporarily suspended. May 22, 1938: Regular service on the line resumes. September 4, 1945: The second section of Train No. 4 enters a siding near milepost 126 in the City of Santa Anita at excessive speed and derails. Some 200 people are injured, five fatally. One cleanup worker dies the following day in a freak accident. June 15, 1954: The California Limited is withdrawn from service. A wide variety of steam- and diesel-powered locomotives served the California Limited over the course of its lifetime. a Dining car that served "the best Fred Harvey meals on rails"
Though the cars would in time change to the all-steel heavyweight variety, followed eventually by stainless-steel lightweight construction, for years the consist of the California Limited remained at only six cars per section. This page was last modified 03:39, 1 October 2014.